The pristine, rugged country around To’hajilee, just 30 miles from Albuquerque, is starting to be discovered by filmmakers. Some pivotal episodes of the hit TV series “Breaking Bad” were filmed here, as was a scene from “The Lone Ranger.” Actor/director Mel Gibson is due to arrive today to work on a project. The people of To'hajilee Chapter have but one thing to ask of the "Big Rez": Please stop thinking of them as the "Enemy Navajo." After all, the sins of their traitorous ancestor Sandoval are 200 years in the past. "'Lost Navajo,' 'Pueblo Navajo,' 'Enemy Navajo,' whatever the latest name is," sighed the chapter's executive director, Jim Platero. "People still think of us that way. That's why we're always on the bottom of the totem pole." Chapter President Raymond Secatero, who served as a council delegate in the 1970s, recalled that the other delegates trotted out the "Enemy Navajo" moniker every time he came up with a proposal they didn't like. "We're just trying to get financial assistance and technical support for our people like any other chapter," Secatero declared. But To'hajilee is not like any other chapter. Its people comprise their own band, the Cañoncito Band of Navajo. "Basically, it means we have control over our own land," said Secatero. "We can negotiate directly with the state of New Mexico and the counties (To'hajilee covers parts of three of them -- Bernalillo, Cibola and Valencia) for services." But, since Cañoncito is a band and not a full-fledged tribe, "We still have to wait on Window Rock to approve everything we do," Secatero complained. "We have a water feasibility study that's been backed up for two years now." 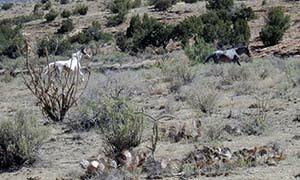 The chapter officials double as the governing board of the band, changing hats when they need to make a decision about land or resources, Platero explained. It's similar to a city council off the reservation incorporating as a redevelopment district board or some such thing. "It gets complicated," said the chapter's accounts maintenance specialist, Carol Piaso. It's just one of the many interesting things to know about this interesting chapter. But millions of Americans know just one thing about To'hajilee: It was the scene of some of the climactic episodes of the hit TV series "Breaking Bad." But once it became a hit, "People started showing up here with their cameras and 'Breaking Bad' T-shirts," she said. "We were like, 'Ooookaaay". "We really should try to make more out of it," Secatero said. "T-shirts and tours and stuff." In reality, "Breaking Bad" is just one of the TV shows and movies that have discovered the pristine canyon country of To'hajilee just 30 miles west of Albuquerque. Scenes from "The Lone Ranger" were filmed here, and a "Breaking Bad" spinoff centering on rogue attorney Saul Goodman is scheduled to start filming in June or July. Today (Thursday), the chapter is expecting a visit from actor/director Mel Gibson, who will be working on a project here for five or six days. Name -- The word is hard to translate into English. According to the chapter's accounts maintenance specialist, Carol Piaso, it roughly means "Where they pull the water up and it keeps refilling itself." The area was formerly known by its Spanish name, Cañoncito, or "Little Canyon," and the people who live here are federally recognized as the Cañoncito Band of Navajo Indians. Major clans -- 'çshiih’, Tábaahá, Nakai Diné'e, Kin Yaa'aanii. There is also a lot of Pueblo blood. Famous sons -- Early headman Sandoval was famous for his treachery, allying himself first with the Spanish and then the Americans (although he was known to double-cross both when it suited his ends). Disguised as a Mexican, he led slaving raids against other Navajo bands and was sorely despised by the Diné to the west, but managed to survive several assassination attempts and finally died in old age after a fall from a horse. Dillon Platero, who chaired the tribe's Education Committee in the 1950s and 60s and helped found Rough Rock Demonstration School was originally from here, as was Code Talker Richard Platero. Issues -- Hours from Window Rock, chapter residents feel "out of sight, out of mind" and say the chapter doesn't get its share of tribal resources. Just a half-hour drive on the freeway from Albuquerque, the chapter has not had much incentive to develop an economic base, and boasts few private businesses. Assets -- A budding film industry, good economic development potential along I-40. The fact that the people here are their own band gives them the opportunity to directly negotiate with the state and counties for grants and services, but most projects must still be approved by Window Rock. The band has twice applied to the federal government for tribal status, but was told it needed to do some more research to prove its claim. "We actually hired a local guy to act as our liaison with the film companies," Secatero said. If the treacherous Sandoval is looking down, or up, from wherever he is, he might be laughing. As pretty as this country is, it was not his first choice. The Cañoncito Band was originally known to the Spaniards as the Cebolleta ("Little Onion") band, centered around what is now Seboyeta, south of Grants. Because they scouted for the Americans during the Indian wars, the Cebolleta people thought they would be shown some mercy when the Navajos were herded to Fort Sumner, but no such luck. They had to go to Hwéeldi with the rest of the Diné, and when the treaty was signed in 1868, they were told it would not cover them if they chose to return to their homeland rather than the newly created Navajo reservation. Some of them went back anyway, only to discover their old lands occupied by Zunis and Mexicans. They settled here near the To'hajilee, which according to Piaso can be roughly translated as "Where they pull the water up and it keeps refilling itself." (The spring is still there, but it's a three-mile drive and then a three-mile walk through a snake-infested canyon; between 75 and 90 percent of the population has running water now.) Starting in the 1880s, the Navajos were issued allotments, but they were homesteads rather than grazing allotments, Secatero said. They weren't big enough to raise livestock in this desert terrain, and with no way to make a living, the taxes were too high for the Diné to pay. Eventually, three Cañoncito Diné filed a lawsuit with the help of the United Pueblo Agency of the BIA, and won. In 1949 the land was placed into trust and the taxes paid through an appropriation. The reservation went from about 40 acres to 76,000, the size it is today. Because it's two hours away from Window Rock, To'hajilee has a lot of its own governmental offices and tribal services, including Behavioral Health, Special Diabetes, an IHS clinic, Navajo Department of Transportation, a courthouse and a police station. There is a K-12 school and a satellite campus of New Mexico State University. As far as private businesses go, however, there's not much -- a convenience store (Cañoncito Gas, which was also featured in "Breaking Bad") and a cute bed and breakfast, Apache Canyon Ranch. "We really need more jobs," Piaso said. But with Albuquerque a half-hour drive away on I-40 (and coming closer to To'hajilee all the time), most people just commute there to work. While cars whiz by on the freeway and chapter officials work on ways to make them stop and spend their money, planes whiz by overhead -- and have since the first commercial transcontinental flights in 1929. The people of To'hajilee were among the first Americans to see commercial airliners. By virtue of its location, "The area is very important to aviation history," said Wes Hobbs, manager of the Grants/Milan Municipal Airport. Transcontinental Air Transport, the first commercial airline, flew directly above To'hajilee on its coast-to-coast runs. If you climb the steep mesa on the south side of the reservation, you will find a curious cement arrow (or if you're too lazy, you can see a restored one in the little aviation museum at the airport). It's one of the few surviving markers those early commercial pilots looked for to guide their craft at night. "They were about 17 miles apart," explained Hobbs -- about the distance a person could see from the air. "They each had their own little generator, and they lit them up at night." It wasn't a perfect system; TAT also logged the first commercial aircraft crash on Mt. Taylor the same year it started operation, killing everyone on board. But it paved the way for the safe, comfortable air travel we know today. For better or worse, To'hajilee was on the map back then. And thanks to Walter White, it is again. If the "Enemy Navajo" can parlay their new-found fame into buildings and services for their community, maybe old Sandoval's descendants can redeem themselves once and for all.